Go west, and explore sublime National Parks and 24 hour cities. With its sun-soaked coastlines, glamorous cities, snow-topped mountains and vast canyons, it’s not hard to see why the Western USA is such a sought-after destination. We offer luxury holidays to the likes of California and Las Vegas that will enthral and inspire, leaving you with memories to last a lifetime. California has plenty to offer nature lovers and city seekers alike. To rub shoulders with the rich and famous, make your way to Hollywood and enjoy a tour of the iconic Beverly Hills. Check out the buzzing nightlife of San Francisco, or take a trip to Santa Barbara to experience its beautiful buildings and renowned restaurants and bars. 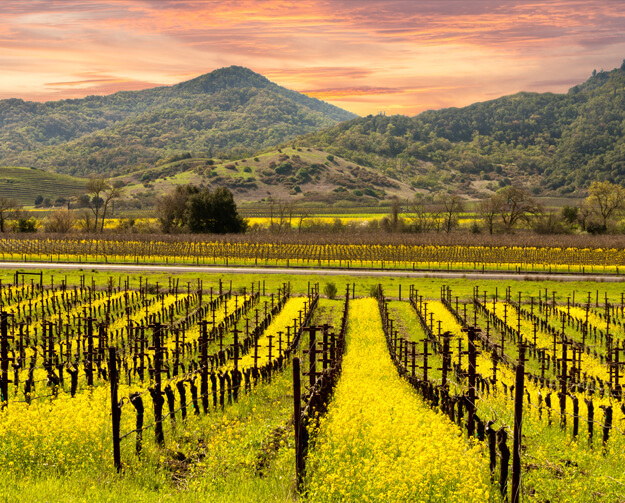 The Golden State is also home to some of the USA’s most celebrated wines. If you enjoy a glass of the good stuff, make sure you don’t miss out on a visit to the acclaimed vineyards. Looking for some crowd pleasing family fun? Universal Studios in Los Angeles is hard to beat. The city is also home to an array of cafés, art galleries and museums. To get the full Californian experience, hire a car and drive along the coast. From the redwood forests in the north to the sandy beaches in the south, there’s plenty to explore. Make the most of the surfing on offer, enjoy dolphin and whale-watching excursions, or take to the skies with a helicopter ride. Further south in the Mojave Desert lies the unique and irrepressible city of Las Vegas. This 24-hour party destination offers casinos, seasonal residences from megastars such as Celine Dion and the Backstreet Boys, performances from the world-renowned Cirque du Soleil and much more besides. Foodies are spoiled for choice along the Strip. Famous chefs and lauded establishments compete to outdo each other. If you’re on a culinary pilgrimage, do your research before you arrive or else you’re likely to be overwhelmed by the sheer level of choice on offer. If you want to leave the bright lights of this glittering metropolis for a while, it’s just a short trip out into nature to see towering mountains, vast forests and gaping canyons. Don your hiking boots for a trek in the Red Rock National Conservation Area, or visit the perfumed pine-filled forests of Mount Charleston. So that you can make the most of the delights on offer in this part of the USA, we offer tailored holiday packages designed to meet your every need. Choose top-class hotels in stunning locations, and our experts are standing by to help you decide on the perfect itinerary. Keen to discover more about our luxury holidays in Western USA? Simply contact our friendly and knowledgeable team by phone or live chat and start planning your adventure today.